The debate about when the middle ages ended and the modern era began, has long been a staple of the historical literature. In order to further this debate, and illuminate the implications of a longue durée approach to the history of the Reformation, this collection offers a selection of essays that address the medieval-modern divide. Covering a broad range of topics - encompassing legal, social, cultural, theological and political history - the volume asks fundamental questions about how we regard history, and what historians can learn from colleagues working in other fields that may not at first glance appear to offer any obvious links. By focussing on the concept of the medieval-modern divide - in particular the relation between the Middle Ages and the Reformation - each essay examines how a medievalist deals with a specific topic or issue that is also attracting the attention of Reformation scholars. 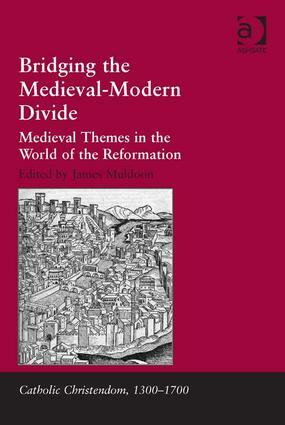 In so doing it underlines the fact that both medievalists and modernists are often involved in bridging the medieval-modern divide, but are inclined to construct parallel bridges that end between the two starting points but do not necessarily meet. As a result, the volume challenges assumptions about the strict periodization of history, and suggest that a more flexible approach will yield interesting historical insights. Contents: Preface; Introduction: bridging the medieval-modern divide, James Muldoon; Medieval roots of the modern image of Islam: fact and fiction, Meriem Pages; Toleration in medieval Europe: theoretical principles and historical lessons, Cary J. Nederman; ’Atheism’ in late medieval travel writings, Margaret Kim; Purgatory and modernity, George Dameron; The revival of medieval biblical exegesis in the early modern world: the example of Carolingian biblical commentaries, Burton Van Name Edwards; Continuity or radical change? Care of the poor, medieval and early modern, Jeannine Olson; Rights, property, and the creation of international law, James Muldoon; ’A divine precept of fraternal union’: the maxim Quod omnes tangit in Anglo-American thought to the ratification of the constitution, Bruce Braisington; Afterword; Index.